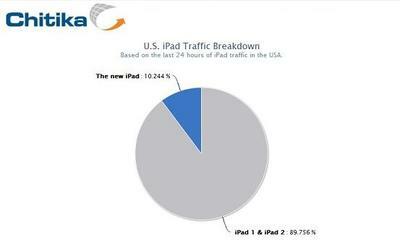 Apple’s new iPad already accounts for ten percent of all iPad mobile ad traffic, Chitika said Monday. The new device is so popular, in fact, that Chitika said the new iPad represented 5 percent of all mobile ad traffic just four days after it landed on store shelves. The numbers are likely attributed to Apple’s sustained growth in the tablet market — the company’s most recent iPad sold over three million during its debut weekend, making for its strongest iPad launch yet. In addition, Chitika included a breakdown by state: California took the top spot where the new iPad represented 11.5 percent of all iPad mobile ad traffic, while Wisconsin, Connecticut and Hawaii all hit the 10 percent mark.